I used to have bad digestion issues and I will take days to finally be able to go to the toilet to take a dump. I tried consuming more fiber, spicy food, you name it. But nothing helps at all. It was getting frustrating and I knew I needed a little push because if I don't, it will have a long-term effect on my body. I came across Audela after seeing a lot of recommendations online. I researched for a little bit and thought I would give it a try. So last puasa, I decided to get a bottle from Tashkila to try. Let's be honest here, it's definitely not cheap. I got it at $89 per bottle but it can last you for a month. For your info, this is to be consumed daily. 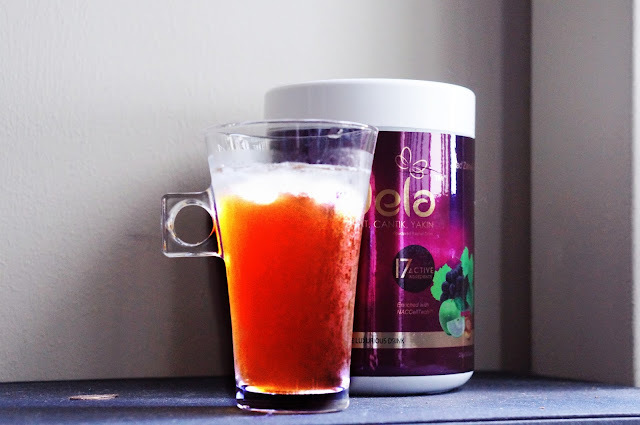 I have recorded a diary during my first 5 days of consumption to let you have an idea what to expect when you drink Audela and how it helped me. They come in little sachets and each tub has 30 of them. So it's just enough for a month's consumption. So the instructions tell me to drink it twice daily for the first week - one sachet before I go to sleep, another before breakfast. I decided to start with just one before I go to sleep. At 4am, I had my sahur and decided not to drink another cup because the timing was too close. Little did I know, it was a decision that I will never regret. I woke up in the morning, running to the toilet and literally had little to no control of how I was pooping. It felt as if I had diarrhea. I'm not really complaining though and kind of expected that reaction. One little problem I saw was that I actually saw a little bit of blood. But I have asked around, most of them had such reactions as well. It wasn't so bad, the toilet bowl wasn't bloody but you could a little bit of red liquid. I got a little worried, of course, but I kind of knew the possibility of this happening. I came out of the loo feeling satisfied and went on with my normal daily routine. I did go back to the toilet once in a while throughout the day, but it was manageable. I knew that my tummy could only take one sachet per day. Second day was the same, but I was more prepared than yesterday. There wasn't any blood this time so that was a relief. To be honest, initially I thought it was a thing I had to deal with Audela. But Alhamdulillah, it was just in the beginning. 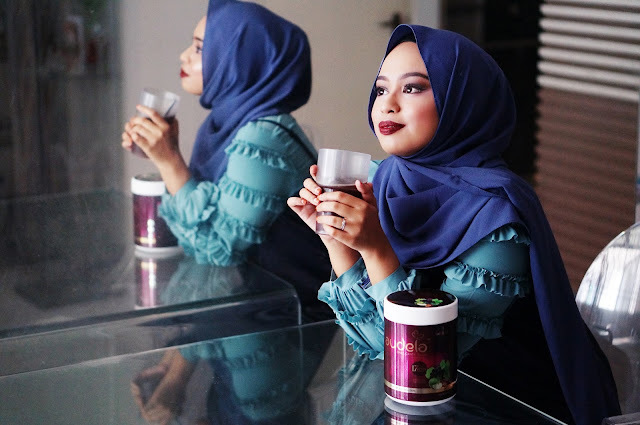 Zul said it was probably a bad idea to try Audela on fasting month. But I felt like it was the best idea ever since we consume a lot of unhealthy food during the fasting month. It was the perfect time for a detox! I finally could see a difference in my tummy. Someone commented on it too. It used to bulge a bit. Well, what do you expect? With fasting + Audela? A good detox combo! It's not really that obvious but it makes a lot of difference if you wear high-waisted pants! Today it was a little flatter than previous days, so I decided to wear my new palazzo pants! With a shirt tucked in! I honestly didn't know I had a lot of gas. I accidentally woke up at 6am because I couldn't stop...well...fart. After a few minutes, I had to run to the toilet and all the goreng pisang I ate last night was out of the way, thank god! Did I tell you how much I love the taste of Audela? It tastes just like grapes. I was quite surprised because I thought it will taste like medicine. Currently, the nights are hotter than ever! It is so humid and Audela helps me to cool down before I go to sleep. Okay, just got onto the weighing scale and I lost 1kg. Yesssss, a few more to go! I am certain now that one of the reasons why I am not losing weight is me not going to the toilet more often. It's really scary how your metabolism can get worse as you grow older. I am a living proof! Will I ever give up Audela? I've never seen anything like this. I've tried quite a few but none can be compared to Audela. So until I find something much, much better, I will not stop the consumption of Audela. I usually buy like 3 tubs at a time because Tashkila always have discounts if you buy more. My sister has started taking and she loves it. My husband is curious and has voiced out his interest so he is going to try it soon! 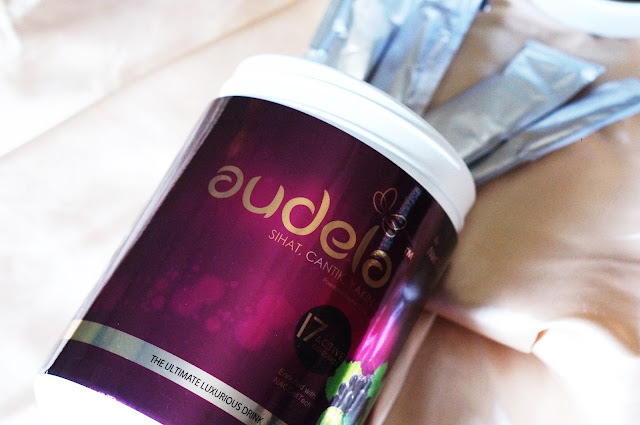 7 comments on "[Advertorial] Tuck It In With Audela"
Great idea! Will do an update! I would like to know if the diarrhoea or frequent bowels came together with cramping of the tummy? Ive tried afew of this sort of products and some can really make perut memulas to the max..
Hello. Nope, it wasn't that bad for me. It was the usual, nak berak kinda feeling. How's your experience with Audela after so many months?